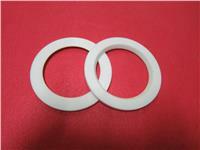 Our High Quality PTFE Gaskets are produced in all of the standard ansi flange sizes. Special sizes and thickness available upon request. SEEFAR seals are designed to deliver excellent purity, low stress to seal, chemical compatibility, as well as reduced creep and cold flow characteristics. Another advantage of our gaskets is their use in a variety of sealing applications, including use with misaligned, damaged, or rough sealing surfaces. 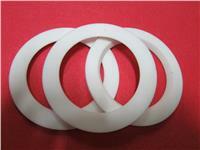 Our PTFE gaskets are produced in all of the standard ansi flange sizes. Special sizes and thickness available upon request. We also offer welded one piece construction for those demanding applications where a pieced joint will not be acceptable.Contact us today for a quote on Seefar PTFE gaskets. 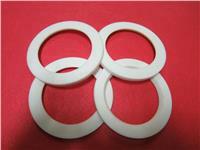 Our seals are frequently used in applications subject to extremely harsh chemicals. Additionally, the wide range of temperature capabilities of PTFE flange gaskets (from as low as –400 degrees Fahrenheit to as high as 500 degrees Fahrenheit) allow for a broad variety of uses and applications. With advantages such as cost effectiveness on large flanges, ease of flange surface conformability, chemical compatibility, versatility, and low stress to seal, our specialty seals are the logical choice for customers in many industries. We have the ability to customize or enhance any of our standard PTFE gaskets with fillers or reinforcements to meet your unique applications. Our customers include companies in the semiconductor, chemical processing, food, pharmaceutical, aerospace and telecommunications industries. With production capabilities including resin compound blending, compression molding, and skiving, we are able to precisely control all aspects of your PTFE gasket from start to finish. Our in house laboratory and quality control ensure that you receive the quality product you expect.